Wailing War — The Western Wall, constructed by Herod the Great in 19 BCE, is an ancient limestone wall in the Old City of Jerusalem. It is also called "the Wailing Wall." It is the holy site claimed by both Muslims and Jews. The 187-foot-high section of the wall is on the western side of the Olde City's Temple Mount. The Wailing Wall faces a large plaza in the Jewish Quarter, which has been a venue for pilgrimage and prayer for Jews since the 16th century. Rabbi Shmuel ben Shimshon, who arrived in Jerusalem in 1211, describes in great detail his first days in the city. He ascended the Temple Mount soon after arriving and often prayed on "the Mount of Olives, the place where they used to burn the [Red] Heifer." (8) But on "Shabbat we prayed the afternoon prayer [on the Temple Mount], on the very place where the uncircumcised used to erect their idols." (9) Again, no mention is made of praying at the Western Wall of our days. What is currently known as the Western Wall then is not mentioned in any source prior to the sixteenth century. It was not mentioned even once in either the Babylonian Talmud (completed in the fifth century C.E.) or the Jerusalem Talmud (completed about a century earlier). There exists an ancient tradition that "the Shechina [God's presence] will never move from the Western Wall." (12) This saying could not refer to the present Western Wall but, instead, described the ruins of the western wall of the Second Temple building mentioned by many pilgrims, including Benjamin of Tudela. Over time, as the visible ruins of the original temple walls disappeared, this saying was applied to the current Western Wall. Suleiman adopted a positive attitude toward the Jews of his realm. He persuaded many who had been expelled from Spain and Portugal a generation earlier to settle in Jerusalem. Some believe that he encouraged Jewish immigration in order to limit the influence of the local Arabic-speaking population. (13) Whatever his motives, Jerusalem's Jews benefited from his benevolence toward them. In the first few centuries after the designation of the Western Wall as a place of prayer, it was utilized infrequently by its intended users. Early descriptions indicate that people came to the wall to pray for divine help only when they faced very critical problems. (19) Another early custom was for some Jews to assemble at the wall during the nine days prior to the anniversary of the destruction of the First and Second Temples (Tisha b'Av) to recite the evening prayer and elegies. Regular, daily, public prayer services, three times a day, did not take place at the Western Wall until late in the nineteenth century or early twentieth century. (23) By 1941, they had become established and so popular that British-appointed chief rabbis Yitzhak HaLevi Herzog and Ben Zion Uziel felt it necessary to issue regulations for proper behavior at the wall. These rules included a prohibition against riding a bicycle through the alleyway; the strict separation of men and women (even though the Mandatory government did not permit the erection of the traditional barrier that separates the sexes in Orthodox synagogues); and an admonition not to start a second prayer service while a prior prayer service was already under way. 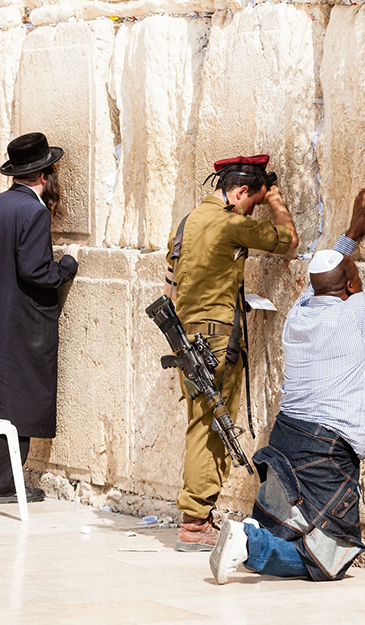 The importance of the Western Wall as the most sacred Jewish site grew immeasurably in the days and weeks after the June 1967 Six-Day War. During Israel's 1948 war of independence, the Jordanian army occupied East Jerusalem and the Old City. The armistice treaty between Jordan and Israel required free access to the Western Wall for everyone, including Jews. (24) However, between 1949 and 1967, Jordan violated this provision and prevented any Jew from approaching the Western Wall. An entire generation of Israeli Jews grew up without access to this holy place. The Israeli government tried to provide alternate sacred sites, such as King David's tomb on Mount Zion and the military cemetery on Mount Herzl, but the inability to access it made the Western Wall an even more venerated place. A week and a half after the Temple Mount and the Western Wall were recaptured, Moshe Dayan, Israel's defense minister, met with the Muslim religious authorities of Jerusalem in al-Aqsa Mosque. At this meeting, he announced that the Muslim authorities would be in complete charge of all religious activities in the mosques on the Temple Mount. Jews would have free access to the Temple Mount but would not be allowed to pray there. Instead he directed Jews to pray at the Western Wall. (26) The Israeli government subsequently accepted Dayan's decision that forbade Jewish prayer on the Temple Mount. The rule was that Muslims pray on the top of the mountain while Jews pray below at the Western Wall. The above writer, F. M. Loewenberg, is professor emeritus at Bar-Ilan University's School of Social Work. Since his retirement, his research interests have focused on the history of the Temple Mount and the Western Wall. (1) The Jerusalem Post Magazine, Sept. 16, 2016, p. 21. (2) Ibid., June 15, 2016. (3) "Report of the Commission Appointed by His Majesty's Government in the United Kingdom of Great Britain and Northern Ireland, with the Approval of the Council of the League of Nations, to Determine the Rights and Claims of Muslims and Jews in Connection with the Western or Wailing Wall at Jerusalem, (Dec. 1930)," League of Nations, Geneva, pp. 10-1. (4) F. M. Loewenberg, "Where Jerusalem Jews Worship: Tracing the changing location of the 'holiest' site in Judaism," Hakirah, Winter 2013, pp. 213-31. (5) F.M. Loewenberg, "A synagogue on Har Habayit in the 7th century: Dream or historical fact?" Hakira, Summer 2016, pp. 253-62. (6) Dan Bahat, "L'zehui sha'arey har habayit batkufa hamuslemit hakduma v'ha'me'ara'," Catedra, 106, 2002, p. 72; Bahat, "L'toldot hitkadshuto shel hakotel hama'aravi," Ariel, 2007, p. 33. (7) Benjamin of Tudela, The Itinerary of Benjamin of Tudela (Jerusalem: Hebrew University, 1960, based on 1907 ed. ), p. 24. (8) The red heifer or cow was burned on the Mount of Olives and its ashes used in a ritual purification ceremony. See Mishna Para; Maimonides, Hilchot Para Aduma. (9) Avraham Ya'ari, Igarot Eretz Yisrael, 2nd ed. (Tel Aviv: Gazit, 1950), p. 78. (10) Ishtori Haparchi, Kaftor v'Ferah, ed. J. Blumenfeld (New York: Beit Hillel, 1964), ch. 6. (11) Avraham Ya'ari, Massa Meshulam m'Volterra b'Eretz Yisrael (Jerusalem: Mossad Bialik, 1959), p. 68. (12) Midrash Exodus, Rabbah 2:2. Leopold Zunz dates the composition of this midrash to the 11th or 12th century while others date it two or three centuries earlier. (13) Bahat, "L'toldot hitkadshuto shel hakotel hama'aravi," p. 35. (14) Y. Barselvi, "The earthquake in Eretz Yisrael in January 1546," Bulletin for Study of Eretz Yisrael and Its Antiquities, 19 (1956), pp. 29-34. (15) Bahat, "L'toldot hitkadshuto shel hakotel hama'aravi," pp. 38-40. (16) Haparchi, Kaftor v'Ferah (Jerusalem: n.p., 1899), pp. 94-5. (17) "Report of the Commission (Dec. 1930)." (18) Joseph Schwartz, A Descriptive Geography of Palestine, trans. I. Leeser (Philadelphia: A. Hart, 1850), p. 260. (19) See, for example, Ya'ari, Igarot Eretz Yisrael, pp. 205-6. (20) Avraham Ya'ari, Massa'ot Eretz Yisrael (Ramat Gan: Masada, 1976), pp. 345-6. (21) Schwartz, A Descriptive Geography of Palestine, p. 260. (22) Albert Rhodes, Jerusalem As It Is (London: J. Maxwell, 1865), pp. 363-4. (23) Keter Shem Tov, cited in Yaakov Gliss, Minhagei Eretz Yisrael (Jerusalem: Mosad Harav Kook, 1968), pp. 35-6. (24) Jordanian-Israeli General Armistice Agreement, Apr. 3, 1949, art. 8. (25) David Ben-Gurion, "Archives for 1967," Ben-Gurion University, Beersheba; "The secret of the disappearing Wall," Israel Hayom (Tel Aviv), June 3, 2016; Mordechai Naor, ed., The Jewish Quarter in Jerusalem (Jerusalem: Mossad Bialik, 1987), p. 112. (26) Moshe Dayan, Story of My Life, (New York: Morrow and Company, 1976), pp. 387-90. (27) See R. Meir Simha HaKohen (1843-1926), Meshech Hochma (commentary on the Pentateuch), Exodus 32:19. The above article is from The Middle East Quarterly.